As one of the first West Virginia players to make the majors, Newman's baseball career is just getting started. Pittsburgh, Pa. - It's every minor league baseball player's dream to make it to the majors. From Rookie Leagues all the way through Class AAA, prospects in major league farm systems compete not only to win games, but to have a shot to play under the bright lights of some of the biggest ballparks in the world. For Pittsburgh Pirates shortstop Kevin Newman, those long years of bus rides, back-to-backs, and patience have finally paid off. After spending the majority of the 2018 season with the Class AAA Indianapolis Indians, Newman received his promotion to majors on August 16. Looking back his early career, it's hard to believe that the California kid flew under the radar for so long. Growing up in Poway, California, Newman demonstrated his baseball prowess early in his high school years. He flirted with .400 batting average during his junior and senior seasons at Poway High School, garnering the attention of many Division One baseball programs. Despite being undrafted coming off a strong high school career, Newman had his sights set on college baseball as a means to fulfill his big-league dreams. "It was my goal to be a major league baseball player," said Newman, "but in high school the focus was definitely more on trying to play in college." Receiving little interest from major league clubs, Newman received a baseball scholarship to the University of Arizona, making an immediate impact on the team. Starting three seasons in the infield for the Wildcats, the standout hit .337 with 112 RBIs. "Going to Arizona and having Coach [Andy] Lopez there was instrumental to my entire development as a player," Newman said. "He helped me so much, got a lot out of me, and opened up my own eyes to the potential I actually had." Newman's star also rose to prominence thanks to his time in the Cape Cod League, a summer college baseball league where teams use wooden bats. As a member of the Falmouth Commodores, he became the first player in the history of the league to have consecutive batting titles, hitting .375 in 2013 and .380 in 2014. Regarded as one of the top NCAA prospects in the country, Newman declared for the MLB Draft in 2015, where the Pittsburgh Pirates selected him with the 19th overall pick in the first round. 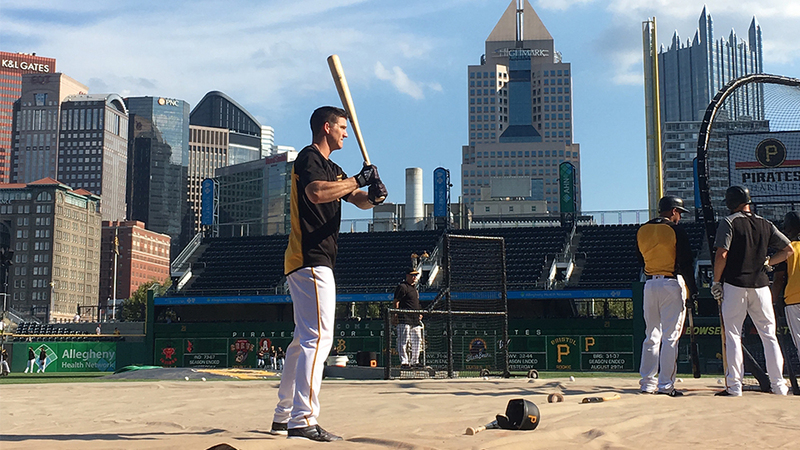 While many prospects remain unsure of their eventual landing spot of draft day, Newman had a feeling that his future might lie in Pittsburgh. "I had an idea," said Newman. "There were a couple of teams that were interested, and the Pirates were one of them. When they called my name, it was great." Before Newman could man the infield at PNC Park, he first had to endure the grind of a rigorous minor league schedule. Starting his career off with the newly formed West Virginia Black Bears, the Pirates' newest shortstop made his way to beautiful Monongalia County Ballpark to begin his baseball journey. Soon after getting settled in Morgantown, Newman was thrown into the world of professional sports. Six-game road trips and long bus rides to other east coast stadiums take a toll on any athlete, but can be especially challenging for a first-year pro. "That first season was an eye opener," said Newman. "I realized that this was what the minor leagues are like- going from town to town on those long bus rides and sleeping on the floor. It was a grind." Even so, Newman worked his way through Pittsburgh's farm system, improving every season on his quest for the major leagues. After almost four years of embracing the minor league lifestyle, the shortstop finally got his chance to realize his childhood dreams. Then on August 20, Newman made his major league debut at home against the Atlanta Braves. Two games later, the Pirates' newest big league cracked his first career hit on the road against the Milwaukee Brewers, laying the cornerstone for what he hopes to be a long and prosperous major league career. Now that he knows what it feels like to be on top of the food chain, a new challenge arises for Newman- staying there. With that in mind, his focus for the rest of the season is making the most of every opportunity he has to step out on the diamond. "I want to finish strong," said Newman. "I want to play good defense and hit well, but getting comfortable being with these guys is a big piece of the puzzle. Not just on the field, but also in the clubhouse, I'm just looking to develop all around going into next year"